My only other internet-based activity is that I have been starting to relearn French, a language I have always known a few basic phrases of but haven’t studied properly since I was around fifteen or so. For this I’ve been using Duolingo, which I’m totally here to recommend even though I’ve only been using it for a few days. It relies on simple repetition in different ways, but every day, with little virtual rewards for each day that you reach your target xp (amount of practice). It’s the perfect example of gamification in action, and it definitely works on me. 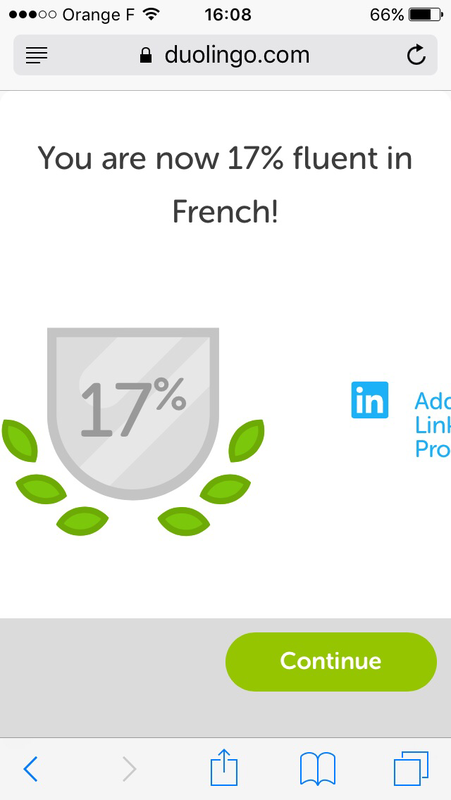 Plus, you get a shiny badge to put on LinkedIn, which can only help me in all sorts of ways. World events have made me want to commit to being a better global citizen (yes, I went there…) and improving my language skills is a good start. After my last blogpost, I started reading up more on technology and global inequality. How much of a divide is there in the world? Is it such a serious social issue? Many of the issues stem from lack of internet access for a large proportion of the world’s population, which denies them access to education and training needed to socially advance or improve their communities. This is an issue that is being worked on through many angles (including the wifi drones that I wrote about last year) although there are plenty of other problems than just the hardware – including fair access under corrupt administration, and cultural issues or actually using it. But in high and middle-income countries, lack of access is less of a problem, but technology is actually making equality worse over time. This article from the World Economic Forum explains it best, basically as jobs have become more automated, the world starts to become divided into those who still have marketable skills and those who don’t. Those who do can afford more personal technology, more education to develop those skills (and their children’s skills) and so the divide grows. Even with programmes to bridge that divide and ensure that everyone has access to useful job skills, countries are reaching a point where productivity can be high but there simply aren’t enough jobs for everyone to have one. I remember being amazed at this video of robots moving stock around an Amazon warehouse (exciting futuristic stuff!) and then quickly realising that this is a job that used to be done by people… and it isn’t just factory jobs either. Recently a Japanese Insurance firm began using a computer system that calculates customer payouts for them, making 34 employees redundant. The scary thing is that the WEF article above (which it should be noted was written a year ago) both calls for a quick response to the issue but is unable to provide clear answers, only ‘innovative thinking’ to solve the problem. Clearly, we didn’t start solving it in 2016, and I have to wonder how many more robots will enter the workforce before we do. Is tech about to hit a slowdown point? Is tech about to hit a slowdown point? And possibly the more important question, does technology need to have a slowdown point? This is something I began thinking about after reading an article from TechCrunch: “Consider ethics when designing new technologies“. This article explained that as technology becomes an integral part of almost every aspect of our lives, ethical issues will result in lack of consumer confidence and therefore a lack of early adopters for new types of tech. Technology has been progressing at an almost exponential rate in the past few decades. But if it hits a point where not enough people trust the tech to make it worthwhile to produce, will the curve of progress finally start to level off? If it does, this might be a much needed change of pace for the world as a whole, if not for the tech industry itself. The gap in global equality is already huge, and not only do we have countries unable to compete economically, but there’s a massive social gap too. Technology has brought us together in global communities, but it risks dividing us again with a loss of level communication. I started this post with the intention of making a fairly traditional list of resolutions for 2017, but as soon as I started working out what to write I was embarrassed to realise that a lot of them would be the same set of promises that I make myself every year: write more blogs, produce videos again, produce music again, be more creative, more productive etc. etc. While I do usually manage some of this, I also never progress as much in one year as I would like, and I think that might be down to promising myself that I will do these things without actually planning for how it’s going to happen. I really want to push on with my blog in 2017, to prove my knowledge of digital content and social media and try to advance my career further. Last year I got a lot out of FutureLearn courses, not just from reading the course content but from exploring the content through my blog. So my first goal will be to read more relevant articles around social media, marketing, business etc. and then try to comment on what I’ve read and/or save important quotes to my blog. I’ll be scanning the below sites on a regular basis for interesting articles to read through and write about. I’ll also look around for other places to read up, and possibly do an update post to this with good sites that I’m using.